An order has come in from China. Someone in China is looking for an old book. “Oh Edward, did you have energy left to hunt for one?” says Natalie Hughes. “What was it?” her husband says, rising from his chair. She squints at her computer, which is running slow. The title is “A Descriptive and Illustrative Catalogue of Chinese Bronzes Acquired During the Administration of John Ellerton Lodge.” Brown cloth with gilt titling. 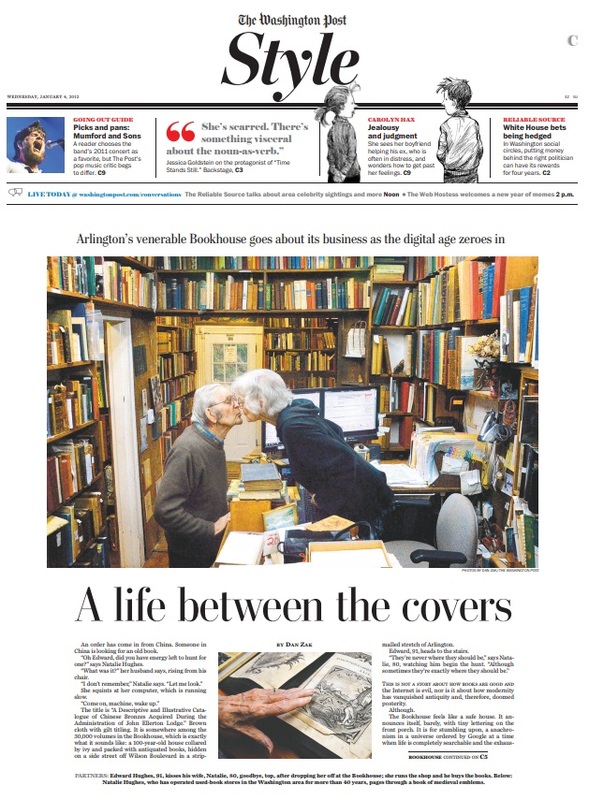 It is somewhere among the 30,000 volumes in the Bookhouse, which is exactly what it sounds like: a 100-year-old house collared by ivy and packed with antiquated books, hidden on a side street off Wilson Boulevard in a strip-malled stretch of Arlington. Edward, 91, heads to the stairs. This is not a story about how books are good and the Internet is evil, nor is it about how modernity has vanquished antiquity and, therefore, doomed posterity. The Bookhouse feels like a safe house. It announces itself, barely, with tiny lettering on the front porch. It is for stumbling upon, a anachronism in a universe ordered by Google at a time when life is completely searchable and the exhaustive hunt for a vellum-jacketed gem has been reduced to a simple tap on a touch screen. Which is a good thing, the Hugheses say. The buyer from China easily found the book this way. But he still wants the actual book in his hands, and now Edward is actually upstairs looking for it, passing his actual fingers over actual shelves of frayed spines. Natalie sits at the counter, at rest, bunkered by stacks of books. Rain taps on the roof. The air smells musty. No customers walk in the door. Natalie was born in the Philippines into a military family and lived on a series of air bases growing up. The itinerant lifestyle forbade the accumulation of possessions. This may be why she made a life out of acquiring and amassing books, she thinks. In 1968, on a whim, she bought 3,000 books for $40 at a hotel liquidation in Bar Harbor, Maine, intending only to read them. Then she bought “Gold in Your Attic,” a guide to collecting books. She was behind the counter in her first shop two years later. Edward retired from the Transportation Department in 1973 and decided that he would raise broadleaf evergreens as a hobby. Natalie had a robust collection of botany books at her bookstore, in a new location on Irving Street in Arlington. They met as customer and shopkeeper. Their first date was a hike in Turkey Run to see the ferns. They were married within a year. Edward got hooked on the book business. He and Natalie moved the operation to the Bookhouse on Emerson Street in 1975. The Washington region is a prime spot for book dealers, Edward says, because aging military officers would rather sell or donate their ephemera than pay to ship it to their retirement destinations. In the early years, the Hugheses drove up and down the East Coast, stopping at estate sales and auctions and shops, scooping up entire attics and basements of books, loading their 1968 Cougar to capacity, sometimes borrowing a brother-in-law’s Volkswagen bus (the one with the shoddy brakes), spending $30,000 or more each year, welcoming customers who would write $5,000 checks for single titles. They anticipate closing up shop in the next year or two, or “when we fall apart,” says Natalie. They’ve stopped buying books. Their son is expanding their nearby residence on three sides to accommodate the eventual relocation of the inventory. You’ll want to take your shoes off here. It’s homey. Titles in stock: “Some Prominent Virginia Families.” “The Furniture of Our Forefathers.” Five thousand dollars’ worth of Dobson’s Encyclopaedia from the late 1700s, though one volume is missing. Getting lost in a bookstore is different than getting lost online. This much we can agree on. Collecting books is a passion inspired by what’s not on one’s bookshelf, says Bruce McKinney, the proprietor of Americana ­Exchange, an online database of 3.4 million titles. About $381 million in books, manuscripts and ephemera were sold at U.S. auctions last year, a healthy and stable sum, according to McKinney, especially given the state of the economy. What’s changing most about the old-book business is the closure of storefronts. If Borders can’t stay in business , there isn’t much hope for other bookseller storefronts. Public places of perusal are vanishing. In the ’80s, in Georgetown and certain parts of Northwest, you’d have five antiquarian bookshops within walking distance of one another, says Allan Stypeck, owner of the 37-year-old Second Story Books. “It’s an eccentric interest, and individuals go into them as a hideaway from reality,” Stypeck says. To time travel. To obsess over the minutiae of a particular subject. So says Natalie Coleman, the Hugheses’ daughter, who worked the counter in her mother’s shop in grade school. She’s talking about Edward, and how he’s constantly buying stacks of books for his grandchildren. Edward’s still upstairs. The ceiling creaks as he hunts. Natalie’s still at the counter. The past 40 years — she would not trade places with anybody in the world. “Not anybody,” she says. The lovely solitude punctuated by a rare visit from someone from the outside, the hot pursuit of undervalued antiquity, the acquiring and cataloguing of history (in pages, not pixels), the final chapters of life filled with the tactile words of long-dead writers . . .
“Usually they turn up,” Edward says. “Sometimes they don’t,” Natalie says.